Need more information about booking Home 943214 ? Our villa is set in the tropical forests of the Angthong Hills, but within a few minutes drive of exotic sandy beaches and close to some of the island's best spas. We are only a short distance from the vibrant capital Nathon with its selection of local restaurants lining the seafront. Also close by are the world renowned Four Seasons Resort, Angthong National Marine Park (made famous by the book "The Beach" and the film of the same name starring Leonardo di Caprio), the Santiburi Golf & Country Club & Spa and the glamorous Nikki Beach Club. Experience the hustle and bustle of local life and the fabulous Thai cuisine in the nearby fishing villages and with so much to see we highly recommend you rent a car to make the most of your stay. Amera is also just 20 - 25 minutes from the airport. Being situated on a hillside, our elevated position gives us some of the most stunning sea views to be found on the island, looking over the Four Seasons Resort and Angthong National Marine Park, down to the glorious local beaches and local fishing villages. Enjoy the extraordinary sunset from your own large, private terraces, or relax in the sun by our private pool, up above the vibrant island villages. Our villa is extremely spacious (320sqm / 3,400 sq ft) and beautifully furnished in local style and sleeps 6 to 8 people in three double bedrooms and a sofabed in the living room. All bedrooms have luxury en-suite marble bathrooms and air-conditioning. The beautiful open plan living and dining area boasts full height glass doors opening directly onto a private terrace and pool, with far reaching sea views. The fully equipped kitchen is separated from the living area by a breakfast bar. Of course we also have access to free Wi-Fi and satellite tv channels. Master bedroom - Kingsize four-poster bed with floor-to-ceiling glass doors leading to a large private terrace overlooking the sea. En-suite luxury bathroom with bath, wc, basin and separate shower. There is also a TV and DVD player. Bedroom 2 - Queen size double bed. En-suite bathroom with shower, wc and basin. Bedroom 3 - Twin bedded room. En-suite bathroom with shower, wc and basin. Double sofa bed in living area. The kitchen is bright and modern and a generous size. There is a breakfast bar, and a large fridge freezer, microwave, hob and oven in case you want to cook at home rather than take in one of the many island restaurants. There is a large corner sofa for relaxing, which also converts into a double bed. Also there is a large screen TV and DVD for your entertainment. The dining area has a substantial dining table and eight comfortable chairs for when you want to dine at home. Separate downstairs cloakroom with wc, and basin. The pool terrace leads off the living area and has a shady covered dining area with ceiling fan for those long, lazy holiday meals. There are two sun loungers, two large rattan sofas and occasional tables for your relaxation. The upper terrace leads off the master bedroom, providing panoramic views, perfect for glass of wine at sunset! Towels & bed-linen are included also a daily maid service. Continental breakfast can be provided daily in the villa by advance arrangement. A laundry service is also available. Our villa manager Alex, will do everything he can to ensure you have an enjoyable stay, he is always on hand to offer advice on local trips, restaurant recommendations and the best places to go. If you prefer to stay by the villa he will be happy to organise in-villa dining for a special occasion. Retreat to Amera Villas for a relaxing and romantic Honeymoon. Amera offers peace and tranquillity allowing you and your loved one to get away from it all and spend quality and romantic time together. We can make all the necessary arrangements in advance for you so when you arrive at the Villa you can relax and enjoy your time together. Please select anything you require from our menu of special services, and if there is something missing, please contact us and we can work our magic and make it happen! We are a group of villa-owners with beautifully appointed villas available to rent and buy, giving you every chance that we will have availability for the dates you require. If the calendar of this particular villa (our reference C4) is already booked for your chosen dates please take a look at the others on this Holiday Lettings website: property reference 260161, 1102949, 943214, 943337, 943466. If you need any further information please do get in touch. AMERA VILLAS – AVAILABLE TO BUY! 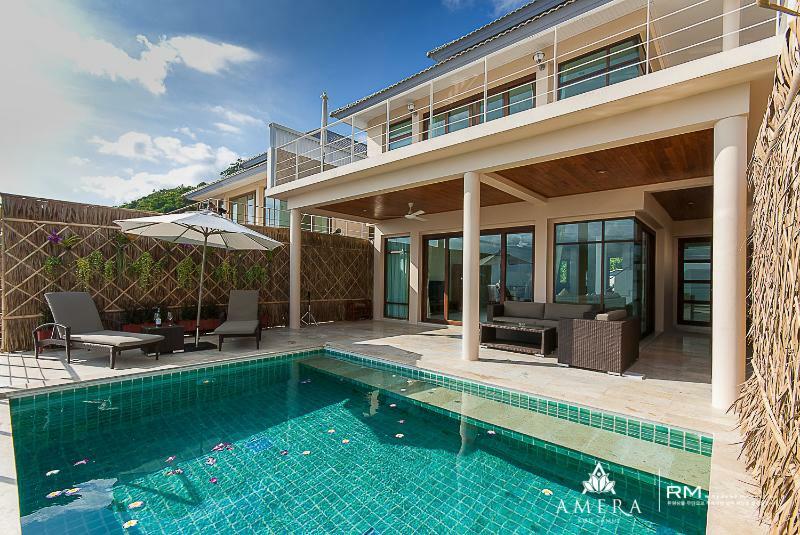 Amera is a newly-developed resort of highly-specified detached villas in a spectacular location in the north-west of Koh Samui with a commanding view of the island's natural beauty – an unbeatable combination of tropical scenery and matchless coastline. Direct flights from Bangkok, Singapore, Kuala Lumpur and Hong Kong make it easily accessible. The holiday season here is an enormous 48 weeks long thanks to the benign climate. This is 2 to 3 times the length of the European season and has a significant impact on rental returns and hence the impressive rental yields. It's beautiful! Voted the second best island destination in the world after the Maldives by Conde Nast. If you wish to bring your pet please send request. The owner reserves the right to terminate the letting with immediate effect if the guest is causing willful damage to the property or excessive nuisance to neighbours or is behaving in any other way which would be considered by most other people to be unacceptable. This includes the use of illegal drugs or any involvement in illegal activities. Response from the owner We are delighted you enjoyed your stay with us. Please come back another time. You can get in touch with Mairead (the owner) through the contact form on this page. Send Mairead (the owner) an email through the contact form on this page. Alternatively, if there’s a phone number on this page, you can call them. How do I contact Mairead (the owner)? If you’ve already booked, go to Manage your holiday booking to view Mairead the owner's contact details or send them a message. Or send Mairead (the owner) an enquiry through the Contact the owner/manager form if you’d like a quote or more info first. When you pay online through the Book your stay form, a booking request is sent to Mairead (the owner). You’ll find out within 24 hours whether they’ve accepted - no money will leave your account before then. You can also request a quote from Mairead (the owner) through the contact form. The owner will email you the total cost for your dates and a link to book and pay online. Use the Book your stay form to pay provisionally online. You can pay by credit/debit card or PayPal. Mairead (the owner) will have 24 hours to accept the booking and no money will leave your account before then. Why can't I call Mairead (the owner) before booking? You’ll need to contact Mairead (the owner) to do this. Send them a message in Manage your holiday booking or through the contact form on this page. You can request to change the dates or number of people on your booking via the Manage your holiday booking page. To change your holiday dates use the Edit booking button. If you need to change the number of guests staying then send Mairead (the owner) a message. If Mairead (the owner) agrees, they’ll send you a revised quote outlining the changes. You can review and accept/decline this from the Manage your holiday booking page. You’ll have 48 hours to take action before the revised quote expires.